With these words Yves of the Belgian/Dutch/German Post Rock outfit Ο (pronounced as “circle” and a SEO nightmare) explained the reasons for the split 7″ of his band with Germany’s PLANKS. The exceptionality of such a collaboration is not the mere fact of a split 7″ of course. But when two extremely strong innovative forces of the current underground music scene find themselves on the same record it is remarkable for sure. All the more because both bands feature a cover song on their side of the EP: PLANKS perform an hauntingly beautiful interpretation of the 1980 The Cure classic A Forest, Ο come up with the Laura Palmer theme from the 1990 television serial drama Twin Peaks by Mark Frost and David Lynch – a score that features a strong subliminal gloominess in its original conducting already but reaches a whole dimension in Ο‘s recording. The long-lasting friendship of certain band members probably did not lead to a similar mood in both band’s musical visions – but surely consistent friendships are often based on resembling views and preferences, especially when it comes down to music. Ο‘s music exists for the pure creation of atmosphere. One might even dare to say, Ο‘s music IS pure atmosphere. The reference above describing Ο as Post Rock is actually quite inaccurate and falls way too short. The term in it’s commonly used sense just doesn’t transport the unbelievable, naturally flowing complexity of Ο. On its previous output the band created compositions so fragile and aesthetic that the listener immediately found him-/herself in the eponymous Black Sea Of Trees, on a strange and sometimes frightening journey through the wilderness in our hearts. The almost orchestral interpretation of the Laura Palmer theme on this split EP manages to keep this fragility and dreaminess, yet also recreates the tension between melancholy and uncertainty of the inital score. PLANKS‘ choice on the other side seems almost compelling. The band’s love for gloomy Post-Punk and Dark Wave became more and more audible with time, especially on last year’s Funeral Mouth. Just as Ο, PLANKS didn’t just play A Forest and made it one of those mediocre cover songs nobody likes to hear. To the contrary PLANKS made A Forest their own song. The interpretation stays very close to the original song for the first minute, which is basically the introduction of the main theme, also featuring that beautiful, short bass interlude. When the drums set in, PLANKS recede from The Cure‘s version – although never so far that one could not recognize the origin. Whereas The Cure (re-)created the blueprint for Goth and Dark Wave music due to the mechanic, uptempo rhythm, PLANKS choose to slow things down, giving the song a overall heavier feeling without destroying the hopeless, dark atmosphere. PLANKS version of A Forest features guest vocals of Mike Hill of New York’s Tombs, a band PLANKS shared a split 12″ with in the past and could be considered as PLANKS brother-band in the US, from a musical as well as an aesthetic point of view. As one might expect, Ο had to face quite some challanges as well in recording the Laura Palmer theme. It’s always hard to recreate synthesizer sounds with a more classic intrumentation, and even more to maintain the inital feeling of the theme while expressing it through one’s own voice. Everything is in its right place – this phrase perfectly summarizes this record, not only on musical but also on visual levels. 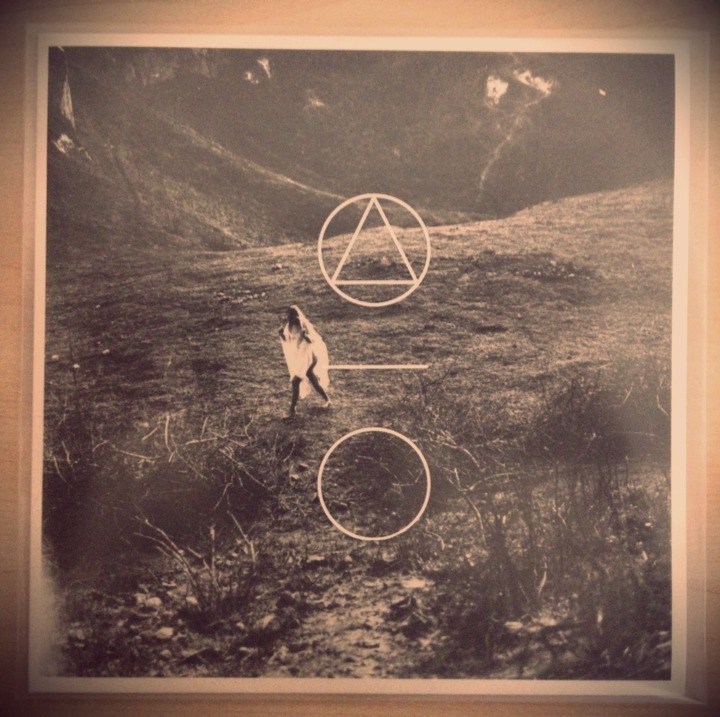 The artwork was done by Yves of Ο and perfectly supports the mood both songs create. The record sleeve is situated in a printed wrapper; the insert is printed on semi see-through paper. 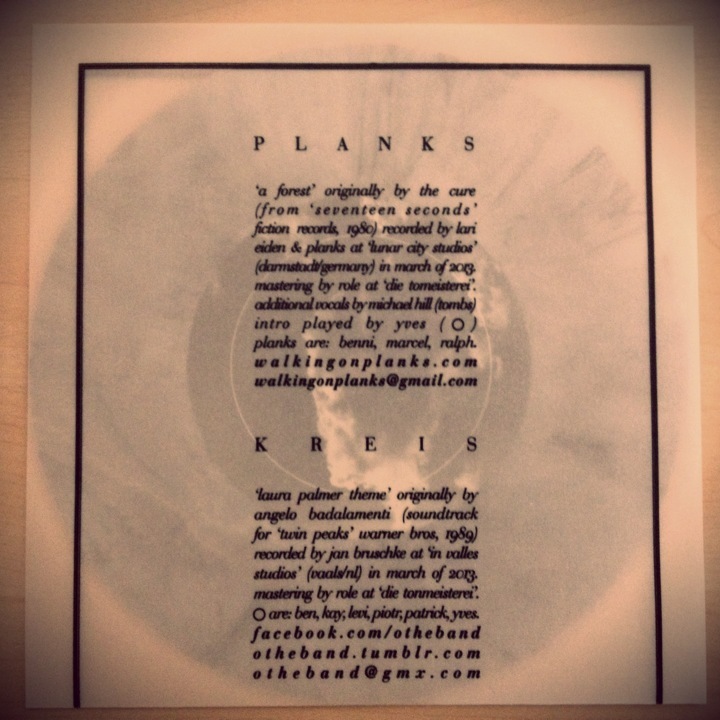 Overall the PLANKS | Ο split is more than just another split 7″. It’s a record that shows both bands from their strongest sides. A split record that makes is impossible to pick a “winner”, because both bands sound so different, yet the consolidation on one record seems like the most natural thing. It’s astonishing how two bands can approach music so differently yet are nonetheless so close to each other. PLANKS | Ο are a perfect match in every aspect. Not to mention the tasteful choices of the cover songs. The PLANKS | Ο split was released on Alerta Antifascista Records on 7″ vinyl. The record is limited to 500 pieces: 300 on black, 100 on clear and 100 on white vinyl with black haze.